Indian fans might be ecstatic to know that the third in the Narnia series, "The Chronicles of Narnia: The Voyage of the Dawn Treader", will release here a week before its US screening. To be the first outing in the series to come out in 3D format, it will hit Indian screens Dec 3 with over 800 prints in English, Hindi, Tamil and Telugu. It is being distributed by Fox Star Studios here. In the US, it will release Dec 10. 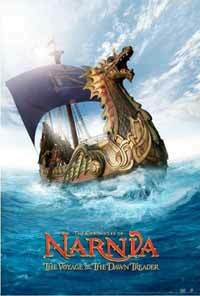 "We are delighted to offer our Narnia fans this unique opportunity and that too in 3D and multiple Indian languages. It's great entertainment which will appeal to a wide cross-section of demographics across the country. The buzz that is building up for 'The Chronicles of Narnia: The Voyage of the Dawn Treader' is very encouraging," Vijay Singh, chief executive officer, Fox Star Studios India, said in a statement. The latest Narnia extravaganza will see Edmund and Lucy Pevensie, who along with their pesky cousin Eustace Scrubb, find themselves swallowed into a painting and on to a Narnian ship headed for the very edges of the world. Joining forces once again with their royal friend Prince Caspian and the warrior mouse Reepicheep, they are whisked away on a mysterious mission to the Lone Islands, and beyond.